Welcome to Shoes to Shiraz and the debut of the Style Perspectives challenge! I decided to deviate from the wrap and focus more on cardigans or sweaters that I could wear as a jacket as the weather (hopefully) starts to get nicer in Saskatchewan. So it was a no-brainer to pick this awesome cardi/jacket that Christy (you can read her post on this same sweater/jacket/cardi here) picked up last year at Nordstrom and that I immediately had to have, so much so that she went out and bought it and then sent it home with my brother for Christmas. And I likely immediately texted her a ridiculous picture thanking her. Yup, there it is. That's what best friends are for. My favourite part of this sweater : the fun fur detail and the jacquard print. I have to wear my hair up with this one otherwise all the hair gets all crazy around my shoulders. My least favourite but also slightly favourite part: the fact that it can double as a jacket. But I have to be mindful wearing it in the classroom...it makes me get sweaty and well, that isn't always the most attractive feature in a teacher. I styled the jacket to go with jeans for a dress down day at work. We get 2ish a month and man, are they coveted. Why is it so exciting to wear jeans to work? I think I would likely be ever MORE excited if we could wear lulus. I suppose Jeans for Jesus has a better ring than Lulus for Jesus. Actually, this would be a very comfy outfit: cozy sweater, jeans, Toms wedges and a pretty bag. I actually wore this to work yesterday and it was perfect because it was only -6 and felt like spring so I didn't have to wear my big parka over it. I paired it with navy blue suede leggings and my brown boots. 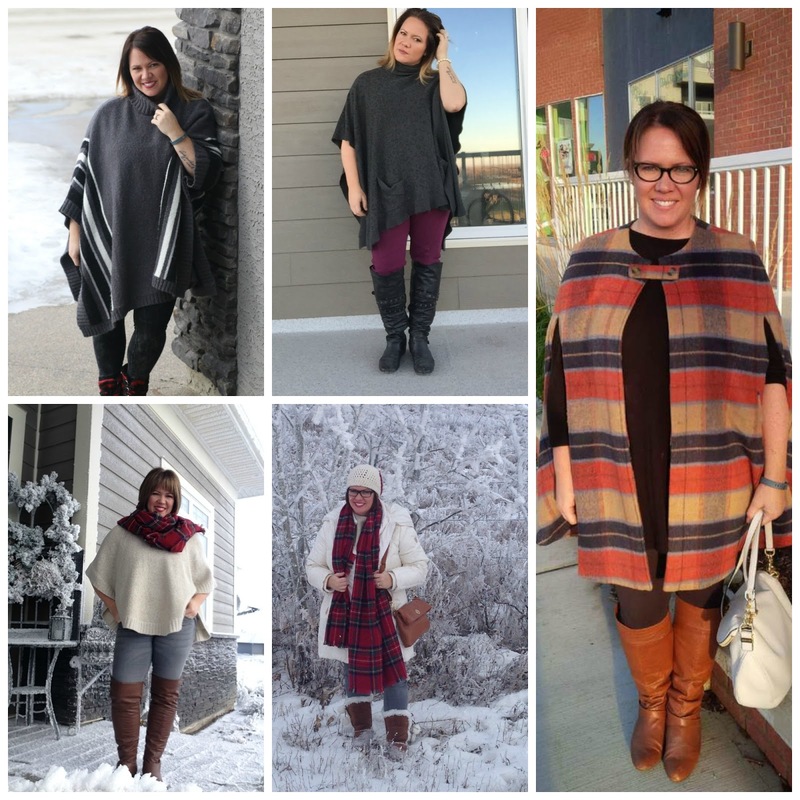 I love wearing oversized sweaters and ponchos, here are a few of my favourites from the past couple years. But my new obsession?? The cape. Here are some of my favourite cape options (and yes, I may have deviated from outerwear with a couple really pretty dress options). I have a couple of these on my wishlist. 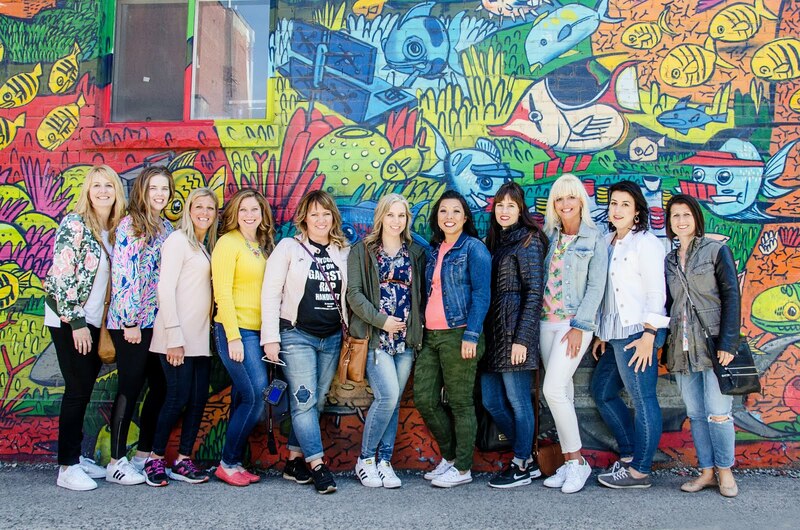 The blogger featured on The Blended Blog showcases her signature style (the prompt for that day) and then the other bloggers (on their personal blogs) show how they interpret it. 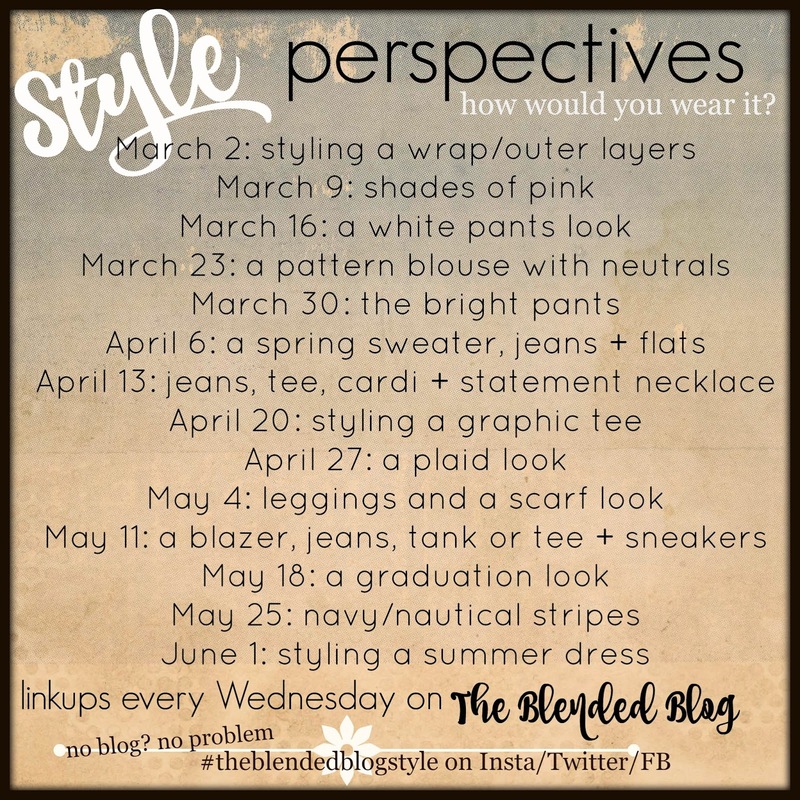 Please link up on the Blended Blog or here to show us how you would wear the prompt! You are so stinking cute! What an amazing sweater, I just love the fur! I adore wraps and ponchos too, I get so hot so it's the perfect weight for me! Thanks for heading up this fun style perspective series, I think it's sure to be a hit! I ADORE that cardigan. For reals. I kind of dislike that you make shopping suggestions because, well, I always like them.... that's problematic. Mostly for my credit card. I love the fur collar - so much fun! You crazy Canadians, thinking -6 is warm :)! You are the QUEEN of the wrap. I just saw Christy's sweater and fell in love. Nordstrom's. Such good and yet bad news. I LOVE IT. You're convincing me on the cape front. Love the orange plaid. -6, dear Lord that sounds awful!!! It looks amazing on you though such a fun piece to wear. My goodness! Way too much great style here. You're almost convincing me to like cold weather (and move to Canada). That sweater...with fur is perfection. Love it! it also looks great on you! You could definitely pull this look off! I need a cape dress. That is all. That's exactly my thought. Fashion = fun. I was going to link it up with your style post today but then I couldn't figure out which team colours it would be...Blue Jays? What is your theme for next month? Isn't it neat how was know each other so well and have never met??! You should definitely make a cape and then blog about it. Thanks for stopping by, Ada. Wraps and ponchos are definitely a necessity with all the snow! You definitely need a cape. Don't let me take you shopping. You know me well, I gravitate to the blue. Crazy Canadian, that is me! We will be an awesome pair in Vegas! Yes please. I second that move. I have maple syrup in my veins, so all is well in the cold. I smiled when I opened your blog and saw your picture. Somehow I felt a real connect to you in this picture. It is almost as if it is animated, and I watched you strike this welcoming, friendly pose. And that Christy is a pretty darn good BFF to run out a get you this sweater after you fell in love with hers. My BFF would do something like that, too. We are blessed. Love that cardigan! Adorable look dear! By awesome do you mean drunk and expensive? That cardigan is fabulous! I love the print and the fur detail! This is such a cute look! I can't image what -6 degrees feels like. I would be in a winter coat all day long if it was that freezing. What a cozy cardigan! I just love the fur collar! I am cold all the time so I could definitely wear that all day! How much fun is that collar?! I love a good statement piece like this. It makes that sweater just stand out! Love the fur and that we can actually step out of the house without our Sorel boots, parkas, snowboarding mitts, etc. I love all of your poncho/cape looks. Seriously though, how many do you own? I'm guessing that -6 is in C? If so, total heat wave! If not, you certainly have maple syrup in your veins. Also, that first picture is the best. Love the print on your cardi, I can see why you just had to have it! :) So nice of your friend to send it to you. The bag in your second photo is really nice too - is it Marc Jacobs? Adore the tassel! I love the pattern and colours of your cardigan! Aw, that's so sweet. I'm just a regular goof and yes, Christy is quite great! it definitely gets lots of comments when I wear it. Cute, yup and crazy definitely! I agree...statement pieces are the best! it is the coziest thing...makes me feel like my cat is snuggling around my neck. All day. Everywhere I go. lol- it feels like spring to us. -40, however, feels like your face is going to fall off. I don't speak Fahrenheit, so yup...definitely beautiful weather for us! ummmm...ummmmm........never too many warm things? My winter wardrobe is WAY bigger than my summer one. Gotta have some fun once in awhile when it's winter and I usually wear black or grey. What a great cardigan/jacket! The fur collar is so fun and I love the pretty colors and pattern. What a sweet best friend! You look mah-velous dah-ling!! The capelet is so cute!! I can't believe that -6 felt like spring! That's cray-cray!! Crazy Canadians, that we are!